The Iowa legislature has understandably been undertaking the difficult process of de-appropriations since the session began. It is never easy to make cuts to the budget in the middle of a fiscal year, however, that is what must occur since our state’s spending is growing faster than our state’s revenue. But just because committee work and floor debate has been focused on immediate budget issues, that doesn’t mean work is not being done on the important topic of tax reform. Iowans for Tax Relief continues to work with legislators and other allies at the Capitol to deliver not just tax reform, but true tax relief to all Iowans. We have had many positive discussions centered around the best path forward for Iowa and we believe that actual legislation reflecting some of those options will be released soon. Tax relief can only be achieved while keeping a watchful eye on spending. Priorities will have to be identified and serious discussions will need to take place about how to reduce or at least slow the growth of spending. Iowans need a plan that lowers rates and reduces the tax burden so they can keep more of their own money in their own pockets. At an ITR co-sponsored small-business roundtable last week, Representative Dawn Pettengill said, “The more you feed the beast, the more government spends.” Last week’s Watchdog newsletter showed the beast is collecting an increasing amount from Iowa taxpayers. Rep. Pettengill is correct that spending is increasing as well. 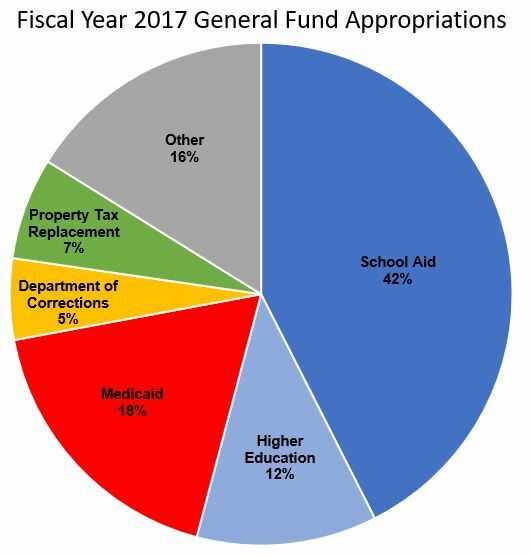 Legislative Services Agency data below shows spending divided into six major categories with the largest impact on the General Fund. Over a 10-year period, General Fund spending increased $1.365 billion. This is an average annual increase of 3.4% from FY 2008 to FY 2017. Of the six categories, Education had the largest dollar increase since FY 2008. School Aid increased $735.2 million or 3.1% over that time period. Medicaid spending grew $521.7 million. This is a 5.8% increase over the 10 years, the fastest rate of increase of the categories listed. Over half of one major category, Property Tax Replacement, has only existed since FY 2015. The Commercial Property Tax Act, enacted in 2013, reduced commercial and industrial property taxes over a four-year period (FY 2015 to FY 2018). To compensate for local government lost revenue, the state “backfills” to make up the difference. Combined, the Commercial and Industrial Property Tax Replacement ($152.1 million) and the Business Property Tax Credit ($125 million) totaled $277.1 million in FY 2017. As ITR said in a Cedar Rapids Gazette guest column, it would be prudent for policymakers to review the property tax backfill, and make revisions to this policy if needed. Many counties’ property tax collections actually have increased even when the backfill is not taken into consideration. Lawmakers need to remember government spending is not the solution for economic growth, nor can government solve every policy problem. Several states have demonstrated lower levels of spending and taxation not only lead to economic growth, but also the ability to adequately fund the priorities of state government. Senate Majority Leader Bill Dix said, “The objective has always been the same – for more money to be kept by those who earn it.” We agree it’s the people’s money, not the government’s. Since federal tax reform has taken effect, many Iowans have more money in their paychecks due to less federal tax withholding. This article by Forbes explains the changes and takes a look at the new withholding tables. The IRS withholding calculator should be available by the end of February. Real tax relief has real results. It’s time Iowa follows suit!